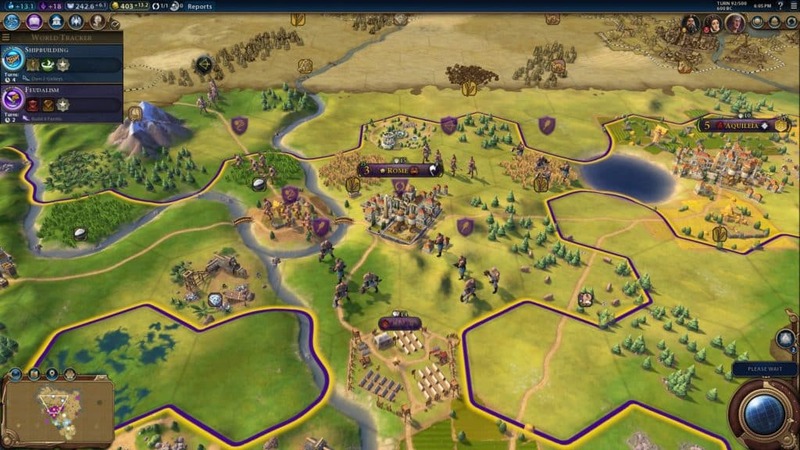 Civilization 6 is a modern take on the classic concept introduced in the series of the Age of Empires games. The idea was fairly simple; you would start off in the very basic era where farming and agriculture were the biggest keys to survival and your army was not well equipped to handle situations as well. Then as your base focused on research, your knowledge advanced and with enough research, you could transition into a different era of civilization which would bring numerous wonders for your base and your people. Civilization VI takes that concept but with many twists to it. Where Age of Empires was a real-time strategy game, Civilization is a turn-based game. Both games have single player and multiplayer modes as well to offer a lot more incentive to the player to keep coming back to them. 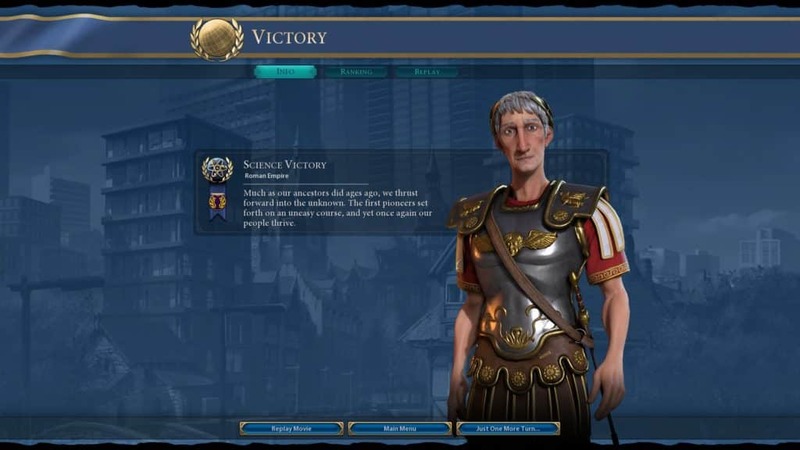 Civilization also makes use of various leaders in the game. Leaders are specific to different computer-controlled civilizations and each has different personalities. You have the freedom to decide whether you would like team up with different leaders, fight against them or remain neutral with them and keep a distance from their conflicts and battles. The goal of the game is to become the most powerful and influential civilization on the game map that you can be and the path you choose to make that happen is up to you. You can either be diplomatic in your approach or be ready for conflict every single time. Each path you choose will have its consequences and advantages and that is what makes the game so fun and interesting to play over. You are put in different situations each time you play and having the same situation replay has a very low chance of happening. The game offers various expansion packs that bring a lot more elements into the mix. Each expansion costs a decent price and is hence optional. Even without them, you can fully enjoy the game. Before following the instructions to download, make sure that the Linux system you are using is version 16.04 and have the Steam client installed. 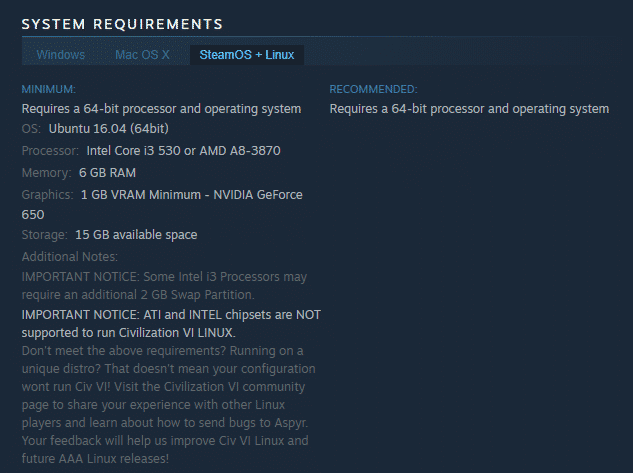 The official system requirements do not list the latest version (18.04) as supported and any errors you get on the unofficial version will probably never be fixed unless the developers release the game officially for that version. Once you are sure about your operating system version, make sure that you also meet the hardware requirements of the game. 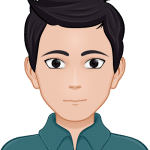 Failure to comply might not always result in launch failures but performance issues are highly probable and without meeting the minimum requirements posted by the developers, no one will be able to help you as well. After you’ve made sure you fulfill the requirements, all that’s left is to download the game, we will have to do everything from the Steam client. The first thing we need to do is log in to our Steam account. If you do not have a Steam account yet, go to Google and search for ‘Steam account creation’. The first link should take you to the Steam website and from there you can create an account and download the client. 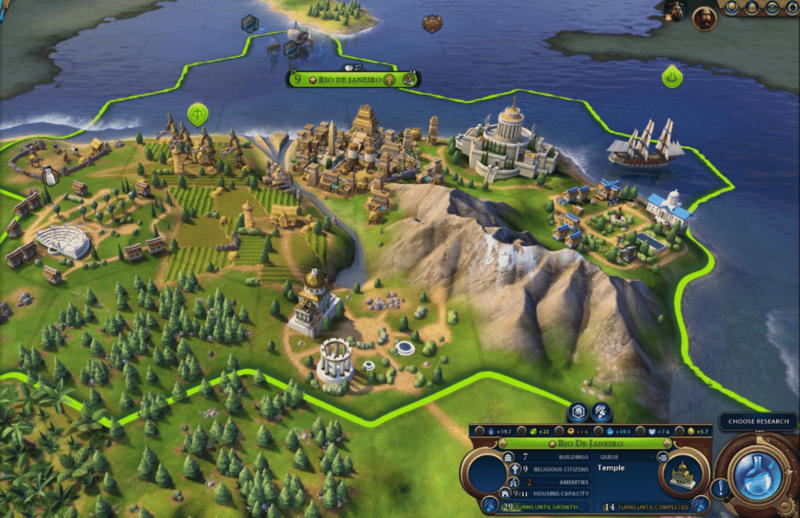 Once you are logged in to the client, head over to the store and in the search bar, type in ‘Civilization 6’. 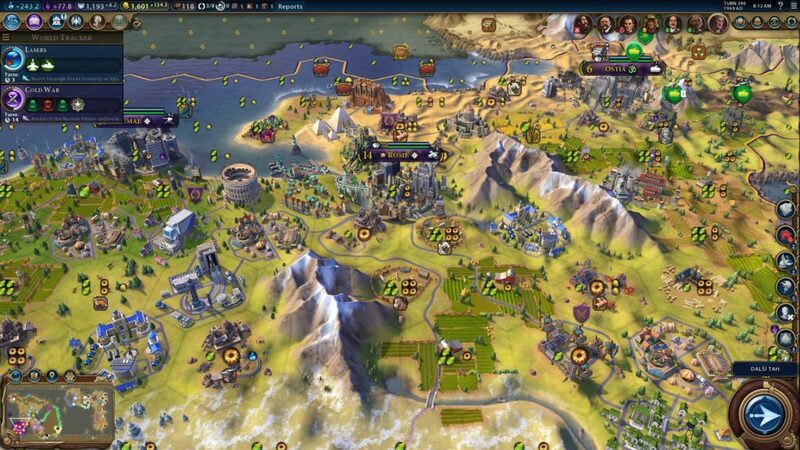 The results will give links with the full name of the game which is Sid Meier’s Civilization VI. From there, you get the option to buy the game along with its expansions too. In the beginning, I would suggest to try out the original game first before you move on to buy the expansions since you never know if a game will appeal to you in the long run. Once you have purchased the base game with a valid credit card or Steam wallet funds, you will see the game in your library. From there, you get to choose where to install the game and the download begins. Once the download has finished, Steam will begin to download the game itself and you do not have to do anything with it. Once the game has finished installing, you will be able to play it without any hassle by clicking the play button from the library of your steam client. The Civilization series is not a normal game that you can just jump into and begin to start playing and expect to do well. 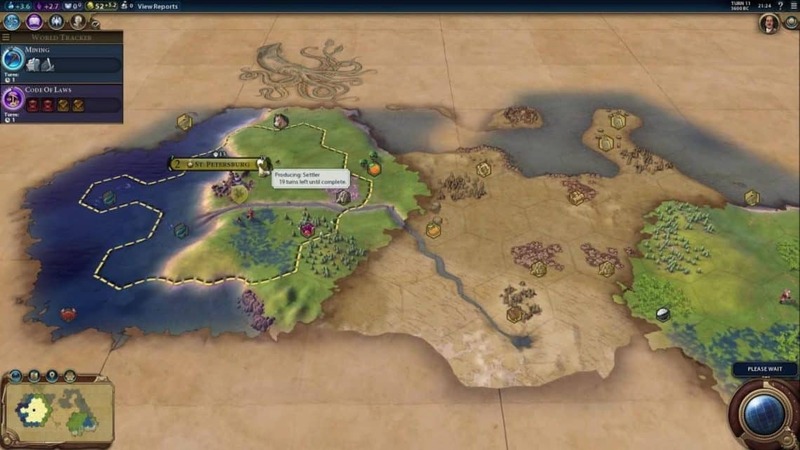 If you have never played a Civilization game before, you should go through the tutorials first so you know what each button, menu, and toolbar are for and how can you utilize them fully. One of the worst things you can do in a strategy game is to not fully understand the mechanics and under-utilize your abilities simply by not having enough knowledge of how the game works. Another thing you should avoid is going straight to the online section without having spent time with the single player mode. The game may not be highly complicated, but getting crushed in online mode will surely make the game less fun to play and irritating as well. Be sure to understand how the game progresses and works in single player mode first and when you are confident about your skills, go into the online mode with full confidence. From personal experience, this game requires patience and is not one of those games where you’ve to go all John Wick. There are no sudden boss battles or exciting moments in the game where everything just picks up from. The game is about progressing in the best and most efficient way possible and that takes time. 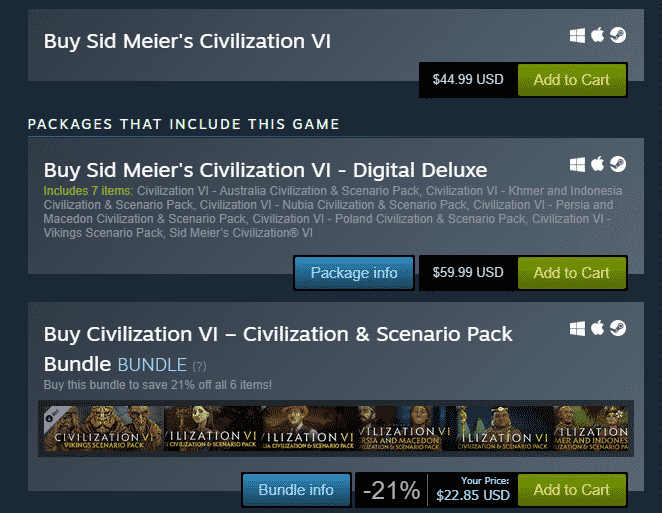 The gist of the game is in progressing and if you want a fast-paced game, then civilization VI is not the game for you and you are better off buying something more involving instead.